As part of our mission to strengthen the community through art, we revealed Chattanooga’s first art bike with a public reception yesterday. The original bike, a 1970’s Schwinn Cruiser, was provided by District 8 Council Member, Andrae McGary, as a show of support for Art 120’s educational outreach programs and events that support the arts and benefit the city of Chattanooga. 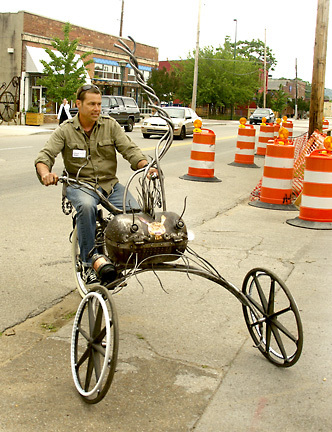 (see image left with bike) styled Andrae McGary’s ride into a work of art that would embody the spirit of Chattanooga. This gas grill on wheels aptly named “Bunnsmoke”, is as functional as it is an amazing work of sculpture. His creation will deliver the sweet aromas of this Scenic City staple in front of 300,000 spectators at The Houston Art Car Parade. Bunnsmoke will also participate in the opening festivities for the American Art Museum Curator’s conference in Houston, Texas. Stay tuned to this blog, or follow Art 120 on Facebook and Twitter for updates images about Chattanooga's art bike the World's largest art car event, The Houston Art Car Weekend.